This blog post originally appeared in the National League of Cities’ CitiesSpeak blog on June 14, 2018. You can access the original article here. As American as apple pie, “freedom” and “opportunity” are the ideals our country is supposed to represent — and that every city leader strives toward. But for too many young people today, opportunity is a promise unfulfilled, and their freedom to choose what to do, who to be, and how to live is only nominal. Two words have recently entered the policy vocabulary: disconnected youth. Often referred to as “opportunity youth,” teenagers and young adults ages 16 to 24 who are not in school or working are considered disconnected. Being unmoored from the worlds of school and work during the transition to adulthood is, needless to say, incredibly disruptive, and the repercussions are long-lasting. Increasingly, policymakers, advocates and other city leaders are using data to identify cities and neighborhoods where young people are disconnected at the highest rates. In the 100 largest metro areas, those disconnected represent between 6 percent of young people (Des Moines, Iowa) to 20 percent (Bakersfield, California). Within cities, the contrasts between the most and least advantaged neighborhoods are even starker. And data can tell us much more. All opportunity youth have one thing in common: they need pathways to reconnect to school and work as well as tangible support. The goals are clear: high school diplomas or GEDs, college degrees or career and technical training, and decent employment. But to help young people get — and stay — on a better path, we need to know what barriers are standing in their way and what kinds of support they need. Measure of America’s latest report, More Than a Million Reasons for Hope: Youth Disconnection in America Today, finds important differences in economic and educational backgrounds, living situations, disability rates, and marriage rates between young people who are disconnected and those who are not, all of which point to a difficult reality: Disconnection is often years in the making, and offering jobs to young people is often not enough. The report also finds that not all disconnected young people face the same challenges. Young women who are disconnected have particularly high poverty rates and unique challenges like early marriage and motherhood that merit attention and resources. A disproportionate twenty percent of black young men who are disconnected live in institutional quarters, which include prisons, detention centers, residential treatment centers, psychiatric hospitals and other similar institutional settings, compared to just 0.3 percent of the overall population their age. 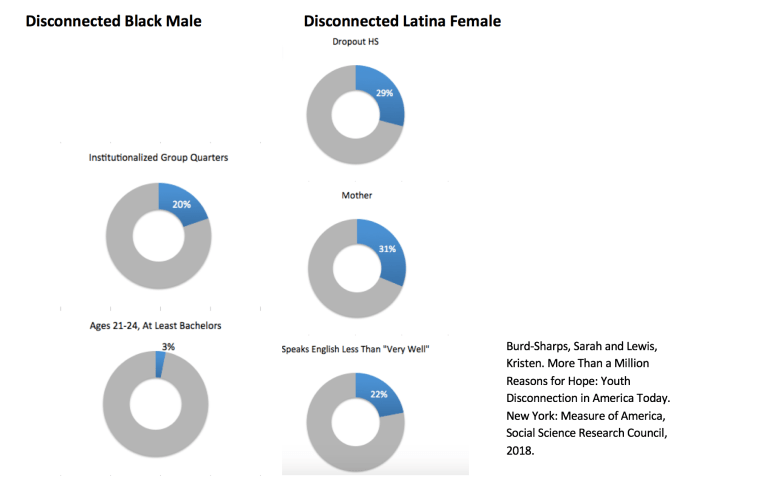 33 percent of Latino young men who are disconnected dropped out of high school—the highest rate of any group. For Asian young people, English proficiency and citizenship are the most notable factors contributing to disconnection. Moreover, growing up in poverty, especially in highly disadvantaged neighborhoods, often isolates young people from the educational options, social networks, job opportunities, and reliable transportation that help connected young people build independent adult lives. Strategies need to be nuanced and holistic in order to be effective. Take Chicago and Houston for instance; both have opportunity youth populations that exceed 100,000 people. However, these disconnected populations are demographically very different. In Houston, the largest group of opportunity youth is Latina women, who make up close to one in three young people who are neither working nor in school; in Chicago, it is black young men, who make up one in five opportunity youth, who face the greatest challenges. The main challenges for these groups are very different, so reducing the rate of youth disconnection in these two cities will require different — tailored — approaches. The greatest challenges facing disconnected Latinas are young motherhood, high school completion and language proficiency; about 30 percent dropped out of high school, almost a third are mothers, and more than a fifth speak English “less than very well.” Young disconnected Latinas would benefit most from programs to connect them to education that include wraparound services, including childcare and language classes. For young black men who are disconnected the most pressing challenges are contact with the justice system and college education; as mentioned earlier, an astounding one in five disconnected young black men are institutionalized, and only three percent of those ages 21 to 24 have a college degree, the lowest rate of any race and gender group. Youth incarceration is one of the most troublesome causes of disconnection, not least of all because policies and institutions have contributed to its unacceptable scale and racial disparities. Locking up young people is not only incredibly expensive — research also shows that it is an ineffective strategy for reforming behavior or reducing crime. A criminal record makes any attempt at re-connection even more difficult, undermining a young person’s chances to lead a productive life. Focusing on criminal justice reform, in addition to college-readiness and post-incarceration reintegration programs, could help reduce rates and racial gaps in youth disconnection in Chicago. The good news is that there are local initiatives in both cities working on these issues—like the Juvenile Justice Initiative and Thrive Chicago addressing youth incarceration and youth disconnection in Chicago, and Hire Houston Youth connecting young Houstonians to employers. But we can do much more. With the growing momentum, there is no better time to build on existing efforts than now. City leaders must not only invest in programs that connect young people to school and work resources, but also do so in ways that recognize the complexity of the issue. Making the most of every dollar invested will take a tailored, evidence-based approach and a willingness to learn more about the root causes and dynamics of disconnection in their cities. A good start is to include both data analysis and the voices of young people who have experienced disconnection as part of the reengagement planning process. This is a unique opportunity to interrupt the cycle of disadvantage in marginalized communities. It is up to city leaders to take it.